12 May The UK Government’s Latest Excuse About Medicinal Cannabis Is Yet Another Deception. Fundamentally the government’s postion on cannabis for medical use hasn’t changed since 1971. Those who follow the Home Office’s statements will have noticed gradual changes but they all seek to reinforce the fundamental premise that cannabis is a dangerous drug of abuse with no therapeutic benefit. Recent ‘adjustments’, shall we call them, of the official position have dealt with the now overwhelming weight of evidence that cannabis does have very real and significant medical value. The response has been to caution that all medicines must go through the etablished system of testing for safety and efficacy. 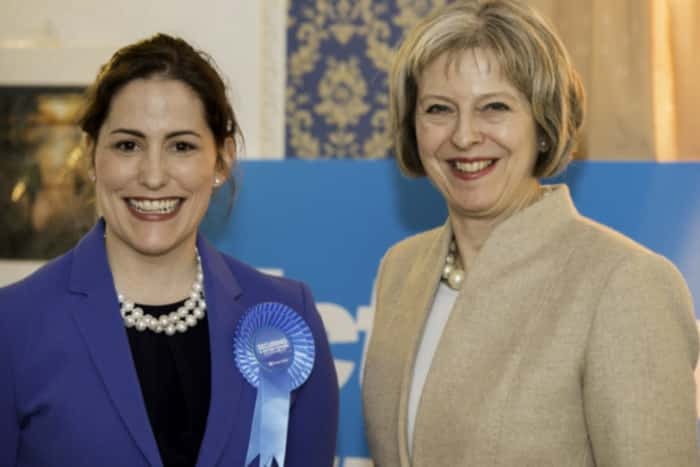 Victoria Atkins MP, Theresa May MP. Both Have Family Interests In Cannabis For Medical Use. CLEAR can further reveal that the Home Office’s public position on prospects for licensed cannabis medicnes is also a deception. The statement that has been published is “As happened in the case of Sativex, the Home Office will consider issuing a licence to enable trials of any new medicine…” We can’t name names just yet but we now have first hand knowledge that at least one publicly-quoted company with established cannabis production facilities in two other G7 countries has been refused permission by the Home Office even to apply for a licence. There appears to be no political will from the main opposition party (Labour) to challenge the Tories on this issue. If they did challenge they would probably have a field day over the Tories intransigence, hypocrisy, and unsustainable stance on medical cannabis in particular – as this is in contrast to public opinion about such. We can only hope that to end this ridiculous impasse the SNP, Greens, and Lib Dems will take the bull by the horns and embarrass Labour by exposing in Parliament the Tories skulduggery over this urgent issue which is very disconcerting to potential and current medicinal cannabis users. More interseting facts that I didn’t know, “Mr May’s company has single largest shares in GW pharmaceuticals” I am a simple Biologist and my interest in cannabis came looking into treatment for crones as it is a family trait ,Mum,Gran & aunt all suffered from it. Alongside Victoria Adkins I think Mrs May should go as how can we trust them if they are still churning out outdated propagana from the ’50s.Ethan Russo in his new role furthers my belief that we need to educate people about the Endicannabidiol System in the school,colleges,Univertities and Medical Schools to get them to understand how this acient medicine could help with people who have an Endocannabidiol deficiency syndrome. We need more TV and newspappers reporting on it.